Candidates age should be between 18-30 years as on last date of receipt of application. Age relaxation is applicable as per rules. Candidates should possess Matriculation/ equivalent with Certificate in General Nursing and Midwifery from a recognized University for post 1, B.Sc. Medical Lab Technology for post 2. B.Sc. Medical Technology (X-ray) for post 3, B.Sc. Medical Technology (Operation Theatre/ Anaesthesia) for post 4. Candidates will be selected based on online examination & scrutiny. Candidates have to Pay Rs.1000/- (Rs.500/- for SC/ ST candidates) in any branch of State Bank of India with the fee Payment Challan duly filled in and pay the fee in Power Jyoti Account No 32211613319 of PGIMER. After depositing the fee in the bank must ensure that they have Triplicate Fee Payment Challan with Journal No/ Challan No given by the bank on it. Candidates should mention this Journal/ Challan number on the space provided in the application form and keep this Challan form for future use. 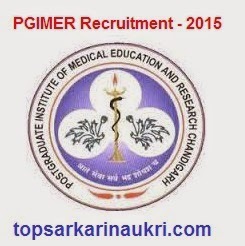 Eligible candidates may apply online through the website http://pgimer.edu.in/ from 16-12-2014 to 05-01-2015 by 23:59 Hrs. Starting to Apply Online: 16-12-2014. Last Date to Apply Online: 05-01-2015 by 23:59 Hrs. Last Date to Deposit Application Fee: 07-01-2015.